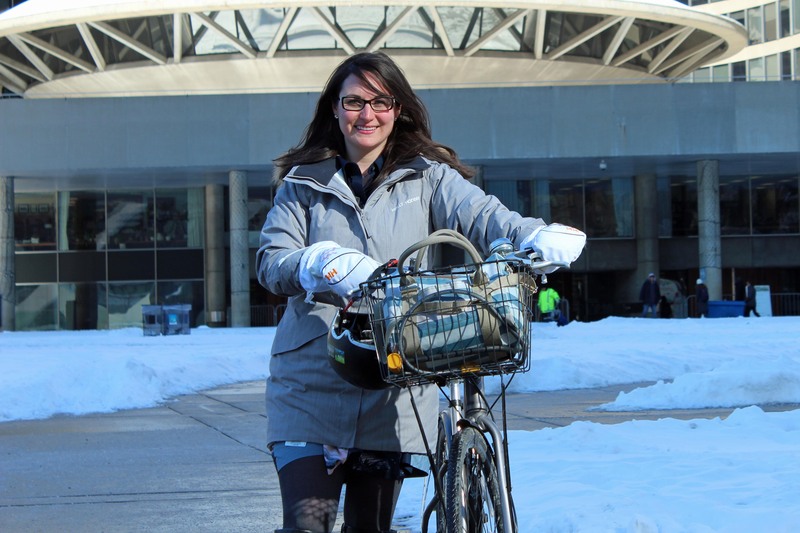 Jacquelyn Hayward Gulati is the City of Toronto's new Manager, Cycling Infrastructure and Programs, Transportation Services and comes to us from Mississauga where she worked for the City for seven years -- the last four as the Manager of the Cycling Office. Gulati has over twelve years professional experience in active transportation and transportation demand management in the public and non-profit sectors. 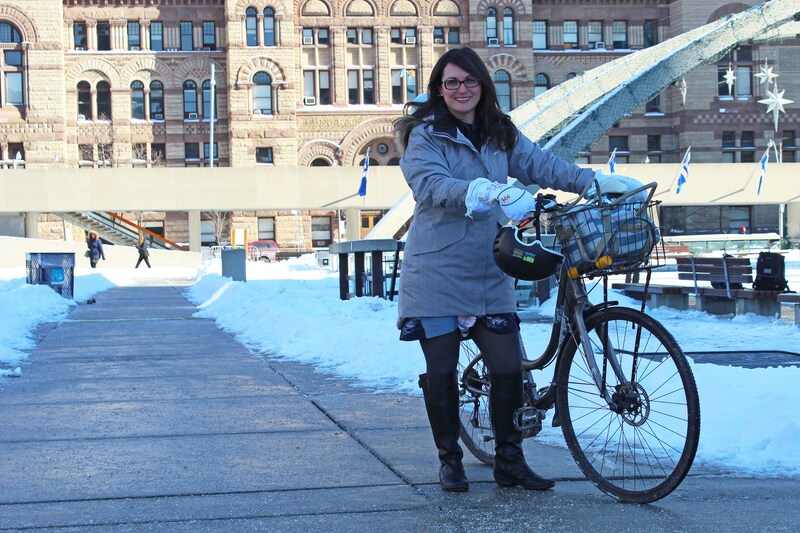 On Toronto; she says she'll never forget the joy she felt the first time biking in a skirt and heels as part of morning rush hour bike traffic along Harbord. We thought that was quite a dandy sentiment. dandyhorse asked the city's new cycling manager how she's going to speed up bike lane implementation in Toronto. Here's our short Q&A with Jacquelyn Hayward Gulati. dandyhorse: Tell us about some of your cycling accomplishments in Mississauga and the lessons you learned. JHG: I'm very proud of what we accomplished in Mississauga over the last four years [the city completed its first Cycling Master Plan in 2010] and of the role I played in that. Over 60 km of new cycling facilities were added, with a substantial number of cycling projects coming down the pipe. I learned that collaboration is key - my leadership style has always been collaborative, but I learned that even more so in my last role. Collaboration with staff in other departments, other levels of government; councillors, advocates and residents - all important! Certainly, there is engineering behind designing cycling infrastructure, and I've learned about cycling design standards from Montreal, from Portland and elsewhere. But in order to implement cycling infrastructure in any place, a collaborative approach to understanding specific stakeholder needs and effectively addressing those needs in the project is absolutely critical. dandyhorse: Mississauga had a focus on recreational cycling and trails - how will you focus more on on-street bike facilities in Toronto? JHG: Mississauga has a wealth of recreational cycling trails, but since the development of the 2010 Cycling Master Plan, Mississauga's focus has been on cycling for daily transportation and building a network of on-road bike facilities and boulevard multi-use trails that connect to major destinations and improve links to public transit. In my previous role, my responsibilities were primarily focused on cycling within the road right-of-way. JHG: I think we need a safe and convenient cycling network. This means reviewing opportunities to install bikeways on arterials, collectors, as well as local streets in order to ensure the network is connected. Arterial streets are generally busier and have higher speeds -- the type of bikeway that would be recommended for an arterial should provide a greater degree of separation between cars and bikes. I know there has been a lot of interest in bike lanes on Bloor Street. Council has directed my team to undertake a bikeway study for Bloor Street in conjunction with Dupont Street. We're hoping to start a feasibility review of this project in 2015. There is no doubt that a bikeway along Bloor Street would be a significant cycling infrastructure improvement, but we need to carefully review the feasibility to understand how the changes would impact things like commercial loading, accessibility and on-street parking and if or how these impacts can be reasonably addressed through the proposed bikeway design. dandyhorse: How will you work to expedite the implementation of new cycling infrastructure? JHG: I have two strategies in mind for expediting implementation, both are about collaboration. The first is working with Councillors and residents on cycling infrastructure projects that they have identified as their priorities. These are the projects where the need for improvement has been identified and there is support to get these projects in the ground. The second is looking at opportunities to integrate cycling improvement projects into the City's wider capital infrastructure programs via road resurfacing, water-main and transit projects. Some of this integration already takes place at the City of Toronto, but I think we can do more. Capital infrastructure coordination can be a cost effective way to deliver cycling projects and expedite the growth of the cycling network. dandyhorse: Do you support the "minimum grid" concept? JHG: I certainly support the expansion of protected bike lanes on main streets and the expansion of bicycle boulevards on residential streets. These are key ways to build a safe and convenient cycling network. We'll be bringing forward a Cycling Network 10-Year Plan to Council later this year which will identify projects that are recommended for the next five years and ten years. dandyhorse: Will you support the expansion of the Adelaide/Richmond pilot project cycle tracks to the east, to connect with Sherbourne? dandyhorse: What have your first few weeks at City Hall been like? JHG: I'm honestly thrilled to be here. My first impression is that there is a great deal of support for cycling within City staff at large. Every day I'm meeting new people as I'm working on getting up to speed on a wide range of issues. It's bigger - more projects, more councillors, more staff, more advocates. It's a complex portfolio and I'm up for the challenge. I feel very fortunate that my staff team (the cycling infrastructure and programs unit) is a group of skilled and dedicated professionals. 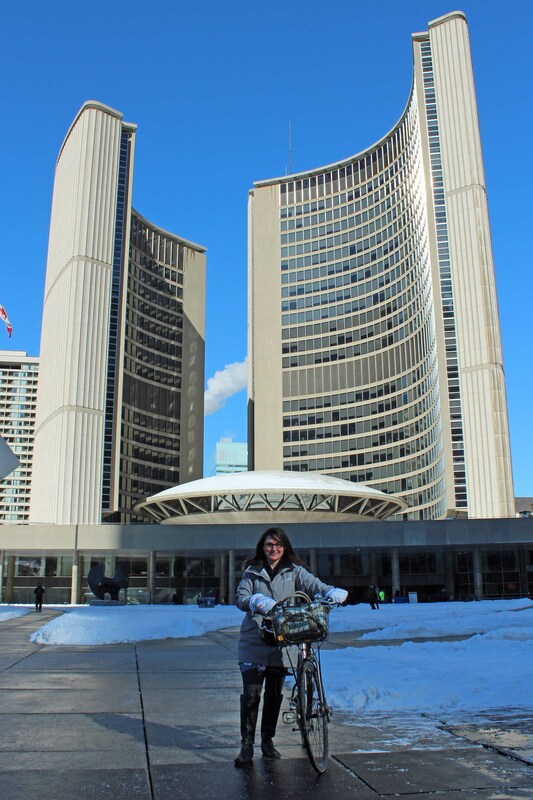 Jacquelyn Hayward Gulati, the city's new cycling manager, is ready to roll at City Hall. Daniel Egan previously held the position and will continue working on special projects with the team until his retirement later this year. dandyhorse will also have an 'exit interview' with Egan. Correction: Jacquelyn did not grow up in Mississauga. This was previously misstated in this article.